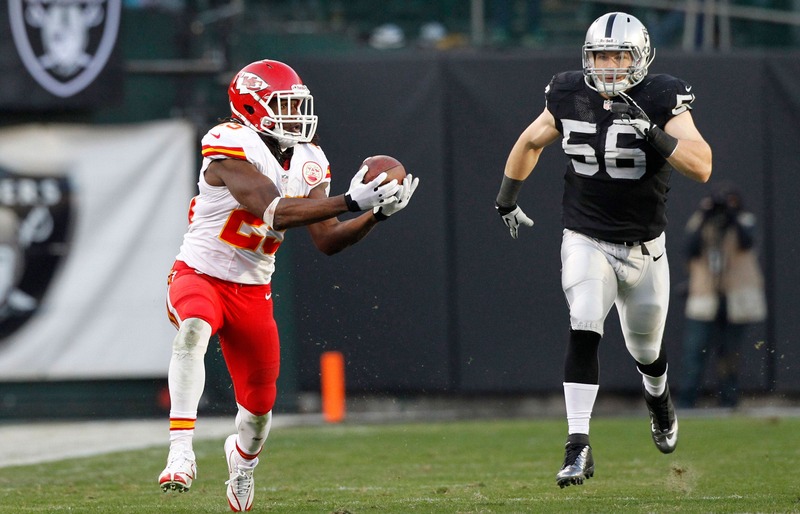 Unless you’re a Raiders fan or played against Jamaal Charles in your fantasy football playoffs on Sunday, you’ll want to see the show he put on against Oakland, scoring five touchdowns. * There were so many must-see moments from Sunday that we’re just going to list them right here. * Bengals punter Kevin Huber ended up with a broken jaw after taking this monster hit. * Dolphins holder Brandon Fields was not ready for a field-goal attempt, so he took the snap right on the facemask. * Falcons running back Steven Jackson destroyed a Redskins defensive back. * Here’s the weekly highlight from Bears wideout Alshon Jeffery. * Seahawks defensive lineman Michael Bennett had the celebration of the day. The Seahawks’ 23-0 blanking of the Giants cost one local car dealership $420,000. Courtesy of Pacers center Roy Hibbert. Royals pitcher Jeremy Guthrie needed someone to have a catch with over the weekend, so he recruited a Twitter follower. Bothering people at the airport can be dangerous and risky, but this worked out well. If you want to hear the truth about drug use (and not just PEDs) in professional sports, listen to this very revealing podcast featuring Scott Fujita, Gabe Kapler and Brendon Ayanbadejo. Model Danielle Ruiz gets today’s Fox-y Lady honors.